Whenever we change or remove the hardware like printer, scanner, monitor and etc, very unlikely we will perform un-installation for the related drivers and services at the same time. Sometimes, we tend to forget or probably not discipline enough to take the extra effort to do the clean up job. Some people might not even know what are the driver and service that being used by the removed hardware and are no longer needed now. These unused drivers and services will be startup upon windows restart that could potentially consume CPU resources. Furthermore, unused drivers contribute to redundancy which could eventually affect your system stability and crash when running the new version of driver. 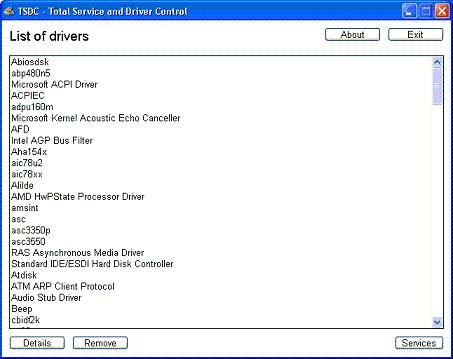 Based on the fact mentioned above, Total Service and Driver Control (TSDC) has been designed to identify and prevent unused drivers and services being loaded whenever windows is starting up. TSDC is a freeware and doesn’t require any installation. Users just need to run the executable file and it will list down all drivers and services available in your computer in few seconds. Based on the report generated, you can identify the unused drivers and services at one glance. If you have doubt of what the driver is before removing it, you can read the driver description by clicking on the Details button. The description basically tells you what the driver is, and the impact if you stop the services from running. TSDC is compatible to run in Windows 2000, XP or Vista. If you would like to get yourself a try on this utility, download it at here.